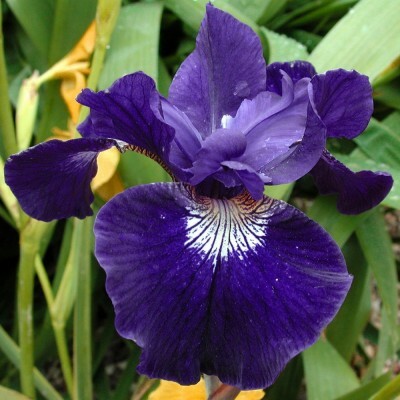 Blue-violet with darker veining; good for edge planting. 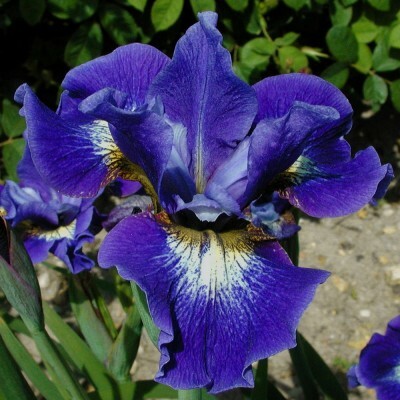 Superb medium to dark-blue large heavily ruffled flowers. Yellow throat lengthened by a wide white spot veined in blue. A tetraploid variety. 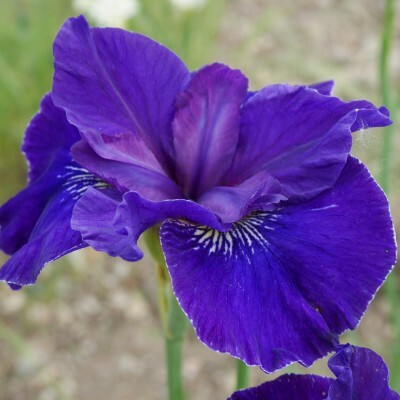 A veritable pompom in mid bluish-violet ; falls decorated with a white reticule. The number of flowering heads is doubled if not tripled which gives a very unusual effect. 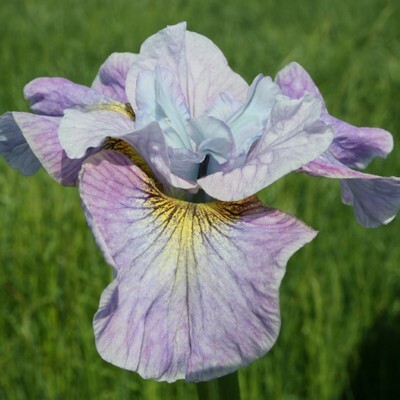 Clear pink purple falls with standards in the same tone but darker. A real rosé-amethyst masterpiece. Will sometimes bloom again in autumn. 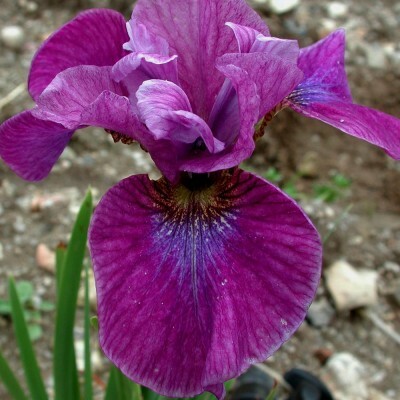 Pale lilac-pink standards lightly veined in red-purple. Red-purple falls with a green throat. New and attractive colouring. 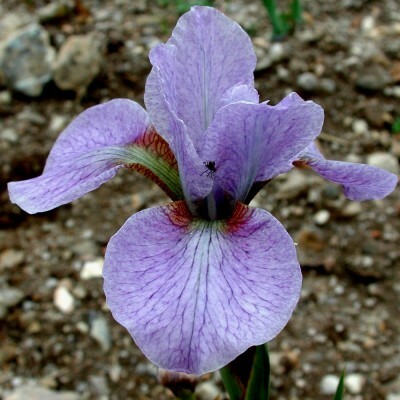 Vigorous plant, result of the cross between iris sibirica and iris setosa. Lavender-white standards and lavender-pink falls with a yellow heart. 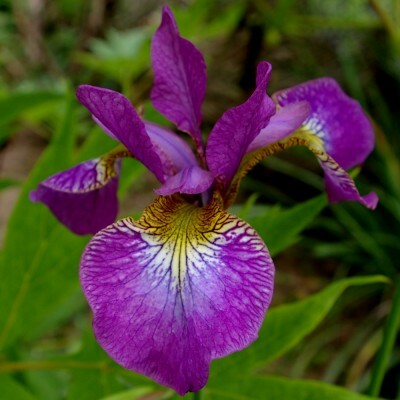 It produces a lot of flowers and quickly forms strong clumps. 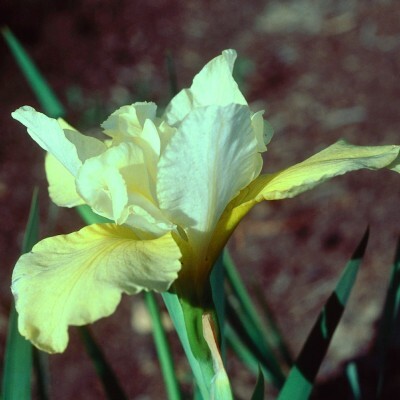 A tetraploid variety. Pinkish-mauve with a big bluish throat and bronze veining. 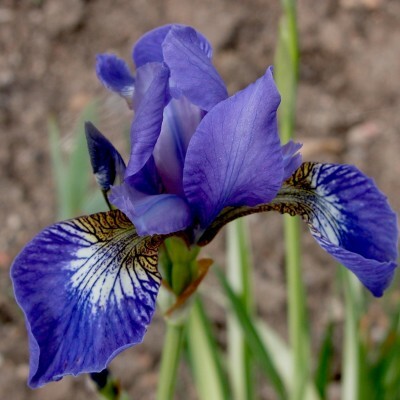 A tetraploid variety. 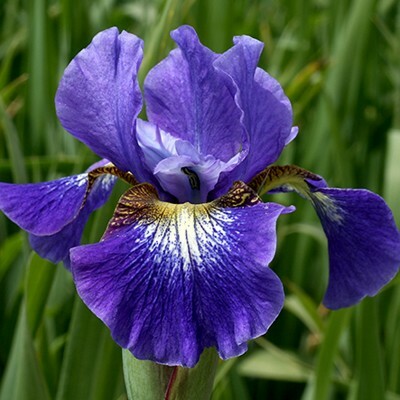 Purplish blue standards, falls in the same tone but darker with even darker veins. Very small flowers and variegated foliage. 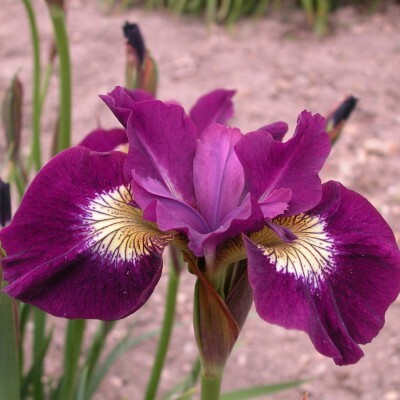 Dark magenta standards and velvety crimson falls with a large golden spot. Gorgeous yet can be tricky to grow. Superb medium wine-red with a small white-veined throat. Pale blue styles ringed with red. Excellent recent variety. Brother of SHIRLEY POPE, but taller and earlier-flowering. 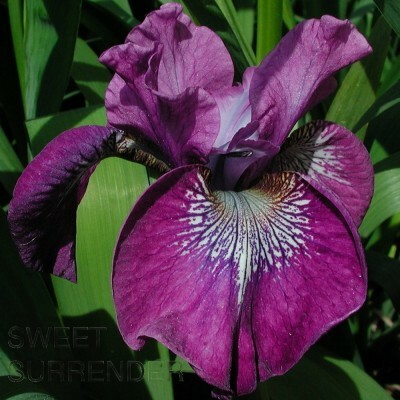 Very uniform flowers, intense purplish-violet with a velvety look. Pearl white standards with light mauve hues. Wide falls amply coloured and veined with reddish purple. 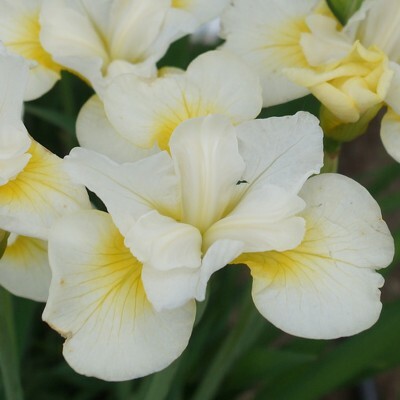 Large cream yellow marking. 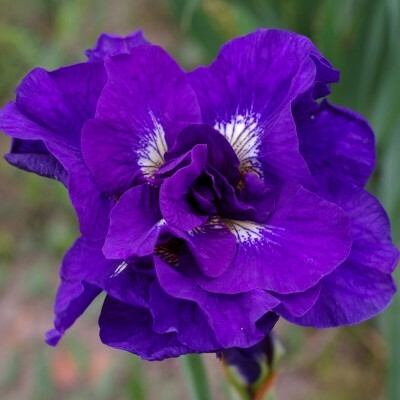 Dark royal purple standards and falls in the same tone with a velvety feel. Cream marking. Large, wavy flowers. White standards and creamy white falls, edged with small ruffles. 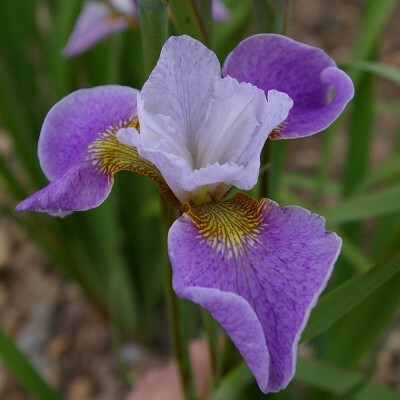 Useful too for its small size and thus for front-of-border planting. 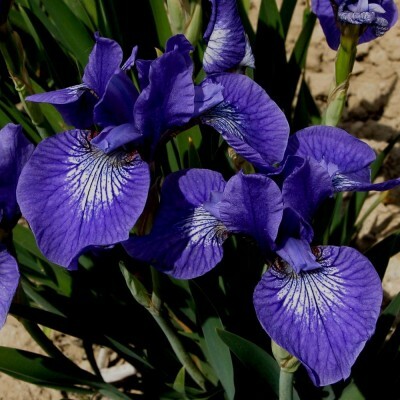 Wide, purplish blue flowers of firm substance. Fine white edge around the falls. Small white spot with purple veins.